While anchored in Port Ellen, Islay I managed to finish a few alterations to the rig. Regarding the main leech twist I reversed the order of the main sheet so that now the fist pull is from the top, not the bottom. As far as I can observe, this new arrangement has reduced the incidence of twist if not completely eliminated it yet. I have tried to unearth photographic evidence of this but have yet to get a good shot of the new arrangement. I did manage to discover a shot of the old first-pull-from-the-bottom sheeting arrangement and concomitant leech twist. I will attempt to capture photographic ‘proof’ of reduced twist with the new first-pull-from-the-top arrangement next time I sail off the wind to a sufficient degree. First, I have separated the three deck sheet blocks from around one inch apart to around two inches apart. This new arrangement is to avoid the sheet parts getting tangled and locked up – particularly when the the sheet went slack during reefing and jybing (or jibing, or jibbing – not sure how to spell it – and automated spell checkers don’t comprehend sailing terminology ;)). The larger spacing seems to have worked and I have not experienced any jamming so far :). The second improvement was introducing a fore-sheet gallows deflector so the sheets wouldn’t get stuck on the side of the fore gallows when jybing. I have observed from pictures of Jock MacLeod’s Ron Glas that half circle hoops were placed between leech and blocks to enable the sheet to slide from one side to the other without snagging on anything (like my neck, which I experienced when coming over from the Republic of Newfoundland last year). 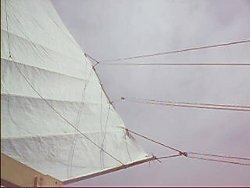 With the current addition of Caer Edin born Alison Roe to the journeys of Ara’ Deg, I acknowledge that the readership of this online chronicle may be expanding beyond Junk rig enthusiasts and those seeking information on the evolving technology of adapting Junk rigs to Western hulls – to include Alison’s North Atlantic fan base. Accordingly, with the help of Alison I hope to expand the scope of this web log to include some info on our travels around the west coast of Scotland and increase its general ‘human interest’ aspect. Tying it all together is the fact that the modern use and development of the Junk rig got its start in Scotland some 50 years ago with the pioneering efforts of Jock MacLeod and Blondie Hassler cumulating in their definitive work on the subject in 1987 – Practical Junk Rig. There is probably no more appropriate place in the world for a modern Junk-rigged schooner like Ara’ Deg to hang out. I’ve yet to observe another Junk-rig here but it’s still early days. This entry was posted in junk rig, junk rig design, junk sail, Uncategorized and tagged alberg 37, junk rig, schooner, sheet. Bookmark the permalink.